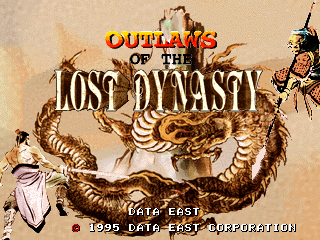 Outlaws of the Lost Dynasty, known as Suiko Enbu (水滸演武) in Japan, is a 2D fighting arcade game by Data East for the Sega Titan Video. It was ported to the Sega Saturn. In the US, the Saturn version is known as Dark Legend. An expanded version was released on the Saturn in Japan only, titled Suiko Enbu: Fuuun Saiki. Main article: Outlaws of the Lost Dynasty/Magazine articles.